The effects of 7 weeks of sprint training (repeated 5-s all-out sprints) on maximal power output (Wν, max) determined during a force-velocity test and a 30-s Wingate test (Wpeak) were studied in ten students [22 (SD 2) years] exercising on a cycle ergometer. Before and after training, muscle biopsies were taken from vastus lateralis muscle at rest for the ten subjects and immediately after a training session for five of them. Sprint training induced an improvement both in peak performances by 25% (Wν, max and Wpeak) and in the 30-s total work by 16%. Before sprint training, the velocity reached with no load (ν0) was related to the resting muscle phosphocreatine (PCr) stores (r=0.87, P < 0.001). The training-induced changes in ν0 were observed only when these PCr stores were lowest. This pointed to a possible limiting role of low PCr concentrations in the ability to reach a high velocity. The improvement in performances was linked to an increase in the energy production from anaerobic glycolysis. This result was suggested in muscle by the increase in lactate production measured after a training session associated with the 20% higher activity of both phosphofructokinase and lactate dehydrogenase. The sprint training also increased the proportion of slow twitch fibres closely related to the decrease in fast twitch b fibres. 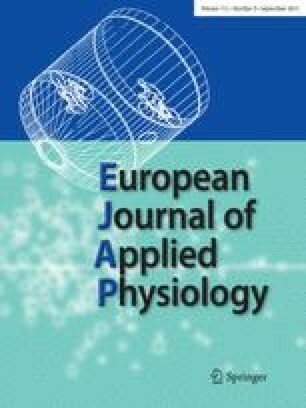 This result would appear to demonstrate an appropriate adaptive reaction following high-intensity intermittent training for the slow twitch fibres which exhibit a greater oxidative capacity.